A Residents’ Parking Zone for Wardrew Road in #EXEStThomas? 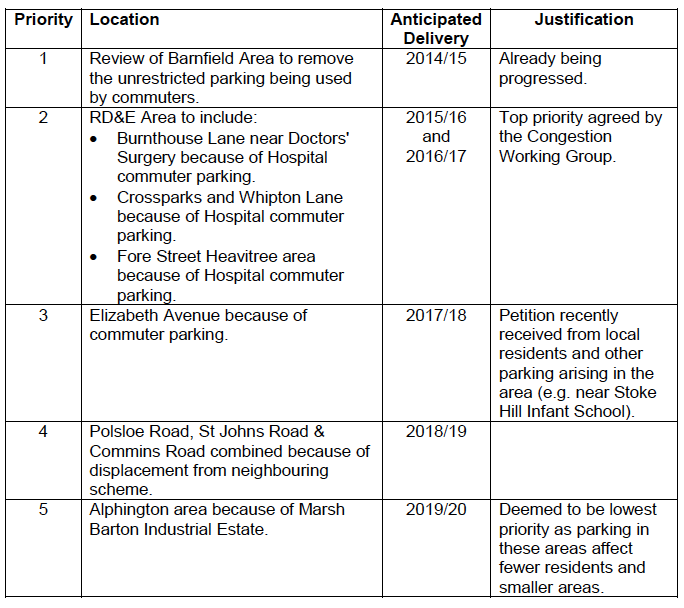 Over the past couple of days there have been renewed calls on social media for a Residents’ Parking Zone [PRPZ] for Wardrew Road and the roads off – both on Facebook and Streetlife. The issue was also raised when the local Labour team recently spoke to residents of Maple Road. One of the problems about establishing a new RPZ is the cost. Just to install simple double yellow lines requires a statutory Traffic Regulation Order, which cost in the region of £4,000 to advertise the relevant details – I haven’t an estimate on what it costs to consult and make Residential Parking Zones, but undoubtably much more that than £4k. As a result, Devon County Council, through the Exeter Highways and Traffic Orders Committee [HATOC], has come up with a set of priorities across Exeter. The Committee considered the report of the Head of Highways, Capital Development and Waste on an update on the future delivery of residents parking in Exeter in accordance with identified areas put forward for consideration by the Committee’s Congestion Working Party and previously updated by this Committee on 08 November 2012 [Exeter HATOC – Report from the Congestion Management Working Group]. (b) that the priority list be reviewed every two years.